Going out for a training run, the last thing you are doing is thinking about the temperature of your stomach skin. Next time you are in the middle of your run, touch your stomach. Most likely, it will feel cold and maybe even clammy. Changes in your cardiovascular system cause your stomach to remain cold while other parts of your body warm up during a run. Your torso, or stomach as it is commonly referred to, houses the organs responsible for digestion, urination and to some extend, reproduction. Your digestive organs, mainly your stomach, small and large intestines, are the most anterior of the organs. Deep to these are the kidneys, liver and pancreas. Your cardiovascular system is dynamic, meaning it can change based on the needs of the body. When you exercise, the working muscles call for an increase in blood flow. Oxygen is essential to energy production and blood supplies it. To facilitate this need, your blood vessels to your muscles dilate. Blood is then shunted away from the organs that are not working because they are not in need of a large amount of oxygen. During running your body is not focusing on digestion, urination or reproduction, so blood is diverted from the stomach area, which may be cause for a cold stomach while running. During running your body is also focusing on regulating your body temperature. Heat is a byproduct of cellular metabolism. The muscles working the hardest, the leg muscles, are producing the most heat. Therefore, in an effort to cool your body, blood near the working muscles is also moved toward the skin so that it may cool down through convection. Since your stomach is not doing nearly as much work as the leg muscles, blood is shunted away from the stomach skin causing your stomach to remain cold. You may be wondering if you should be concerned about your cold stomach. The truth is, if your stomach is cold, your body is doing its job. 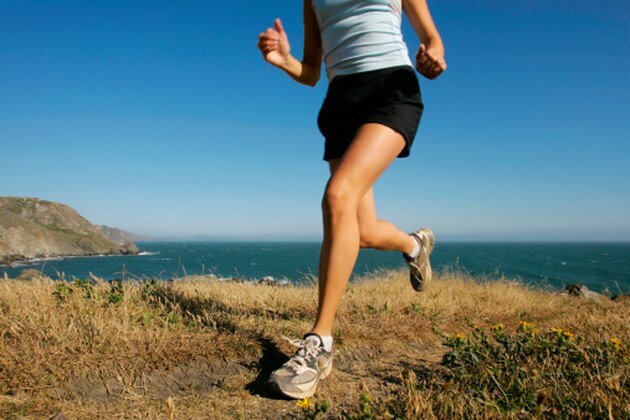 Your leg muscles, heart and lungs are the most important places for blood flow while running. Symptoms that should lead you to stop exercise are nausea, light-headedness, confusion, decrease or no change in heart rate with exercise, leg cramps, a drop in blood pressure or pain in your chest. If you experience any of these symptoms, stop immediately and seek medical help. UNM.edu: Thermoregulation; Chantal A. Vella, et al.